PicoSure is the latest and greatest invention in the tattoo removal industry. It’s both faster and more effective at removing unwanted ink, including both older tattoos that are traditionally more difficult than newer ones and tricky colours like greens and blues. PicoSure uses ultra-short pulses that are just one trillionth of a second in length to hit the tattoo particles with massive amounts of pressure, smashing them into tiny pieces much quicker than a laser can and getting rid of the tattoo much faster. Magic! 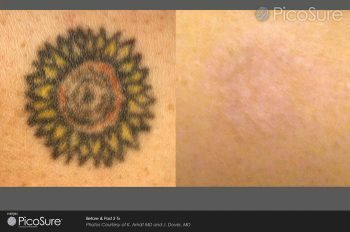 What makes PicoSure even more special is that it can be used to remove tattoos that have resisted previous treatment with Q-switch lasers, or that have stopped fading even after treatment. It can also be used to remove green and blue inks, which are traditionally the most difficult colours to remove, and still get amazing results. You’re guaranteed to need less treatments than other methods, too, but the number of treatments you’ll need will be determined by factors such as the size and age of the tattoo, as well as its colour. For more information or to book a consultation, contact Pulse Light Clinic today.